The D-segment has been an unexciting segment lately. A few years ago, there were quite a few options to choose from and competition was tight. Over time, cars like the Honda Accord, Hyundai Sonata and Volkswagen Passat have been phased out. Despite newer generation models being offered internationally, most car makers are still hesitant to bring them to our market. Toyota's Camry has been around for some time in India, however, and it seems to be constantly upgraded as well. The only other car that competes with the Toyota Camry is the Skoda Superb. These are the only two cars that make up the segment today. The last time they battled it out, it was the Superb that emerged on top. This time around, the Camry gets important updates and even gets a new hybrid powertrain. The Superb has just come out. It is all-new and is even more promising than before. It has brought back much needed excitement to this segment but can it win again? Toyota's current design language pursues an edgy theme. It's very evident on newer models like the Camry and even on the soon to be launched Innova Crysta. The Camry isn't all-new but its new face goes well with the rest of the car. There's a lot of chrome detailing, giving it a more elegant character. It's a smart looking car. The Skoda Superb, however, is easily one of the most attractive cars sold in the country. The new age styling is based on the sleek Skoda VisionC Concept. Gone is the limo-like silhouette and in comes a more sloping roofline. It's still a long car but a lot more proportionate than its predecessor. The aggressive and sharp design makes it stand out. It's a clear winner here when it comes to exterior design and presence. Step inside and both cars have very different design approaches. While both get well-crafted interiors, the Camry feels a bit plasticky. There's a lot of faux-wood detailing too. The Superb on the other hand features higher quality materials and ditches faux-wood for gloss black inlays. The dashboard is less cluttered than the Camry. Some might find it less luxurious than before but it's a clean design and feels nicer to be seated inside. The Superb is known for limo-like rear legroom, and the all-new model offers even more of it! The Camry, however, is not that far behind and in fact, offers more comfort. The front as well as rear seats are softer and it feels like sitting in a La-Z-boy. 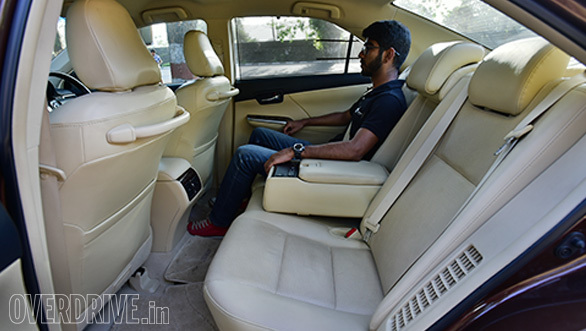 The Skoda's firmer seats, however, are more suited for long drives. Both cars get switches mounted on the side of the front seat for the rear passenger to operate. Unlike the Superb, the Camry offers reclining rear seats (up to eight degrees) and the rear arm rest features stereo controls. These features pamper the rear occupants and earn the Camry extra brownie points. The Skoda Superb offers a huge 625-litre boot, that's almost 200 litres more than the Camry. The difference is this high because the Camry's hybrid system's batteries take up quite a bit of space. While the Camry's boot opening is like any other saloon, the Superb offers a larger opening like a hatchback. The Toyota Camry's 2.5-litre petrol unit gets additional power from an electric motor, while the Skoda Superb features the proven turbocharged 1.8-litre engine. Both the units are ultra-refined and you can't hear either engine on the move. In fact, at lower speeds, the Camry runs on pure electric power and the petrol motor doesn't even come on until one steps on the gas. 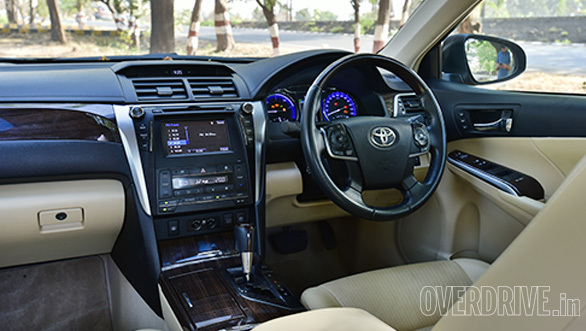 The Superb's NVH levels have improved considerably and it's a notch above the Camry. 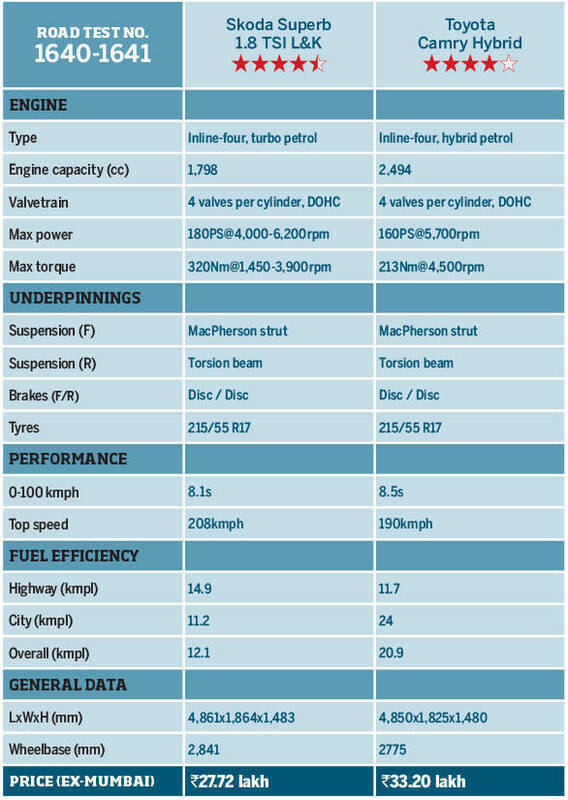 The Camry Hybrid produces a total system output of 202PS and 213Nm while the Skoda Superb generates 180PS and 250Nm. On paper, it's the Camry that seems more powerful but on the road it's a different story. Both cars feature an automatic transmission -- the Camry gets a 6-speed CVT while the Superb uses a 7-speed, dual-clutch automatic. 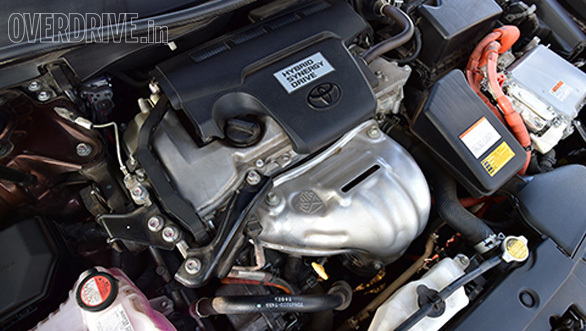 The Camry's AT is a typical CVT, so at full throttle, the rubber band effect gets quite annoying. It's best driven at part throttle and hence makes sense only in town and cruising on the highway. Paddle shifters are standard but it can get slow to respond. The hybrid motor does give the engine extra boost but most of the power gets lost thanks to the transmission. 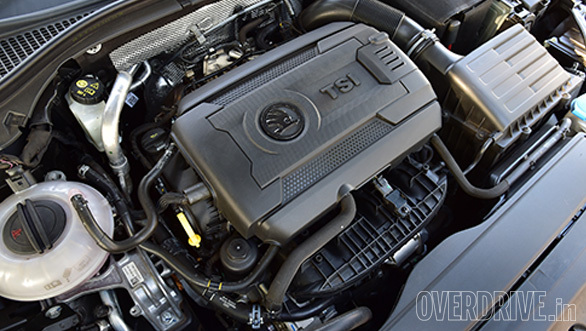 The Superb feels a lot more eager and the turbo motor loves being revved. The 7-speed DSG offers quick and seamless shifts and it is in a different league when compared to the Toyota's AT. Paddle shifters are available in the Skoda too and are a delight to use since it offers instantaneous shifts. Power delivery is strong yet controlled and if needed one can also choose between various driving modes. We tested both cars and as expected, the Superb crosses the line first. 100kmph comes up in just 8.1 seconds while the Camry does this in a respectable 8.5 seconds. 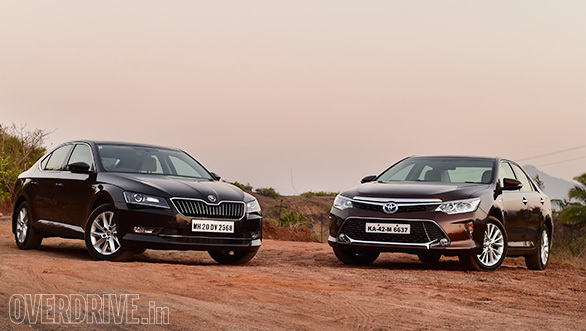 The Skoda Superb maxes out at 208kmph, 18kmph more than the Toyota Camry. The Toyota Camry shines when it comes to city fuel efficiency. Driving in bumper to bumper traffic, the electric motor takes full control. As a result, the car returned a shocking 30kmpl. However, on our test route, the car returned 24kmpl in town, which is still an impressive figure and 11.7kmpl on the highway. The latter figure is lower because the electric motor does not assist at higher speeds. Overall fuel efficiency translates to 20.9kmpl. The Skoda Superb on the other hand returned 11.2kmpl in town and 14.9kmpl on the highway. Overall figure being a much lower 12.1kmpl. Both cars feature independent suspension but the Camry's suspension is tuned to offer better comfort. The car glides over broken patches and undulated roads. The soft setup, however, affects the dynamics of the car. It is prone to understeer and loses grip quite early. The steering is light and feedback isn't impressive. The tyres are also focused more towards lower road noise and are not very grippy. The Superb used to be a neutral handler but in its new generation, it has become more driver focused. One still feels the sheer size of the car when pushed hard but the Superb still puts a smile on your face. The suspension is set up softer for India but it offers a smart balance between ride and handling. Body roll is better controlled and the steering is more precise. The various driving modes also change the steering weight so one can choose a light or slightly heavier setting depending on the situation. Skoda offers the Superb with Hankook rubber, the stickier tyres add to the car's impressive dynamics. The Camry and Superb are loaded with a long list of standard comfort and safety features. 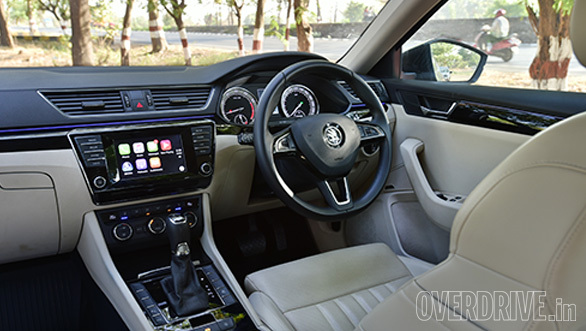 The Superb is all-new so it does get a few more add-ons like ambient LED lighting and smartphone connectivity (Android Auto, MirrorLink and CarPlay). The Skoda also gets clever accessories like umbrellas that slide into the doors. The Toyota Camry makes sense for those primarily looking at rear seat comfort and urban commuting. 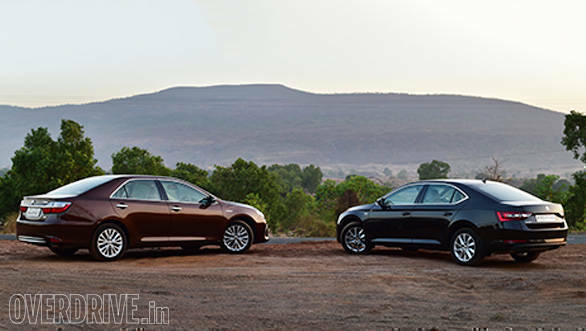 The Skoda Superb outperforms the Toyota Camry in every other aspect. Most importantly, the Superb is priced at Rs 27.72 lakh, ex-Mumbai making it a lot cheaper than the Camry -- Rs 5.48 lakhs to be precise. 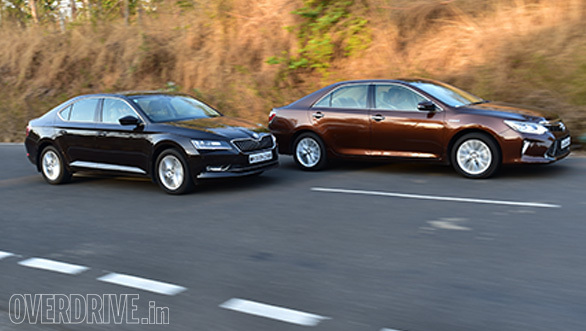 The Skoda Superb, then, is still the best buy in this segment.